With the exception of maybe only 4 years here and there, I have sung "O Holy Night" on Christmas Eve at each church we have attended since 1974. It is my gift to the congregation. 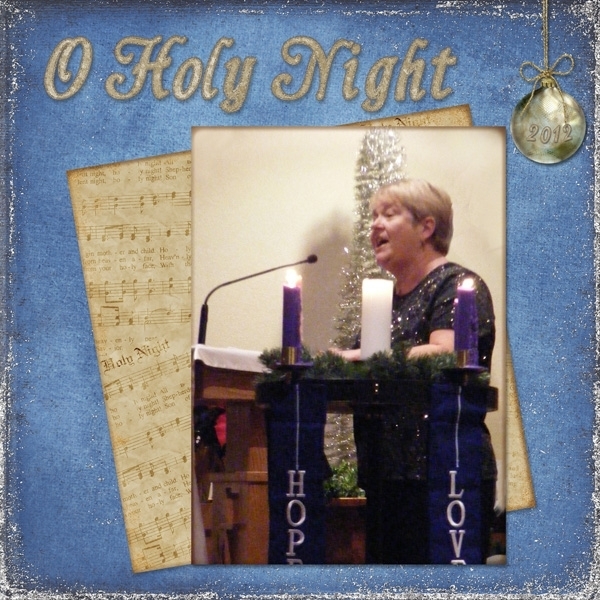 Photo Information for "O Holy NIght"
I love that song! I bet you do a beautiful job singing it! I love the photo and the music behind your photo. I'd love to hear you sing, Becky! I'll bet you sing that lovely song beautifully! Great layout - great photo and I love the sheet music behind your pretty photo! Oh, Becky how lovely to see you singing and the photo is so wonderful I can imagine you singing. I really like how you treated the photo edges and the muscial score behind it. I also really like the touches of glitter and yout title. The year in the ornament completes a really special page. What a wonderful thing to do for your church; I love that song. Great photo, I like that the Advent wreath is included.Love the glittery edes and the bit of sheet music is a nice touch, especially in the nicely contrasting color. My favorite hymn. I am always so grateful and moved by those who share their talent by singing this for their congregation. Thank you! A beautiful layout too! Lovely page! I wish these layouts came with a sounds track. LOL! Such a beautiful song and wonderful gift! How wonderful that you can share your gift of singing with your congregation. Thank you also for sharing the gift of your beautifully done scrapbook page. A real inspiration.